ASA attended the annual Legislative Summit of the National Conference of State Legislators from July 29 to August 2 in Los Angeles, California. ASA was one of more than 200 exhibiting organizations sharing information with more than 5,000 attendees, including over 1,000 legislators representing all 50 states. The 129 policy sessions included many on policy matters related to safe access, including a webinar on lessons learned from states about the opioid crisis. 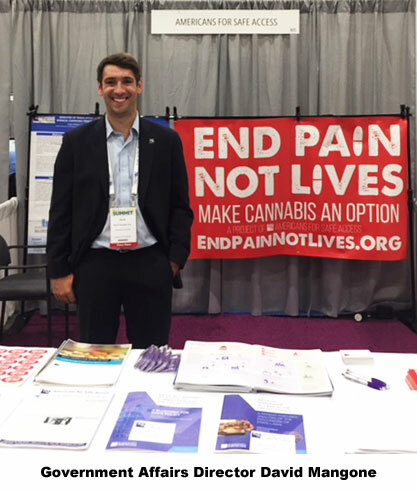 David Mangone, Director of Government Affairs (pictured at the ASA booth), and ASA volunteers delivered to policy makers model legislation for how to allow patients to trade their opioid prescriptions for a medical cannabis card. This model legislation was put in the hands of representatives from every state in the US, as well as two foreign countries. Policy makers also received copies of ASA’s report on the states, Medical Marijuana Access in the US, as well as ASA’s blueprint for confronting the opioid epidemic and other ASA publications. From June 29-July 1, ASA Associate Director Debbie Churgai was in Chicago for an Abilities Expo, where she presented a workshop on "How Medical Cannabis Can Help People with Disabilities.” The presentation explained how cannabis can be an option for treating a variety of conditions and how qualifying patients can access it where they live. The presentation also covered how new patients can learn more about medical cannabis from ASA’s Cannabis Care Certification program. 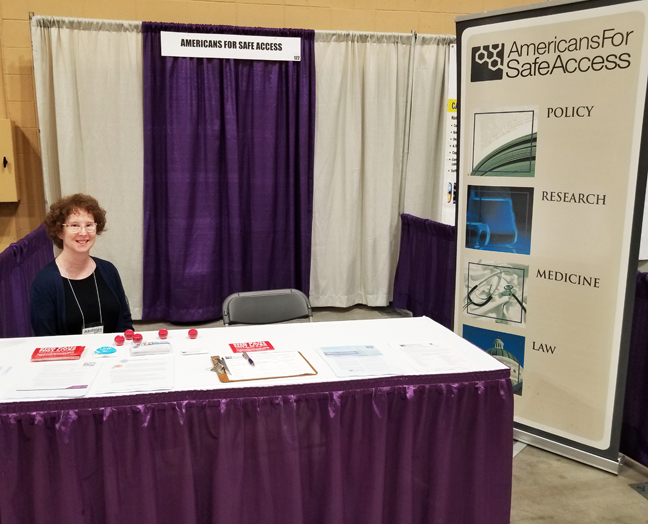 The ASA information table was supported by ASA volunteer, Joy Grainge (pictured). ASA has presented medical cannabis information to receptive audiences at other Abilities Expo events. The expos are about bringing necessary products and services together under one roof for the community of people with disabilities, their families, caregivers, seniors, and healthcare professionals. Upcoming expos are scheduled for Houston, Boston, San Mateo, Toronto and New York. If you are interested in volunteering at an Abilities Expo in your area, please contact info@safeaccessnow.org. ASA’s continuing efforts to advance medical cannabis research and standards took staff around the world the past two months and onto the internet. ASA presented two webinars recently. The first, “IP Solutions for Cannabis,“ is a webinar on patents for industry companies, that is archived on youtube at https://www.youtube.com/user/SafeAccess/videos. The second was a prestigious, accredited LabRoots Cannabis and Precision Medicine Webinar. ASA Executive Director Steph Sherer and Dr. Marcu traveled to Leiden in the Netherlands for the annual meeting of the International Cannabinoid Research Society (ICRS) June 30 – July 6. 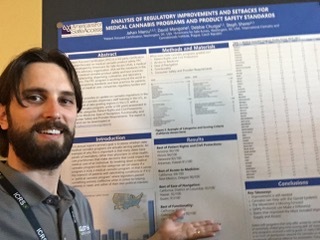 ASA had two poster presentations, one based on ASA’s state-by-state analysis of access in the U.S. -- “Analysis of Regulatory Improvements and Setbacks for Medical Cannabis Programs and Product Safety Standards” – and the other on a study of decarboxylating cannabinoids. Dr. Marcu was the runner-up in voting for president of the ICRS, after being nominated for the sixth time. Just before the ICRS meeting, Dr. Marcu was part of a preconference Cannabis Master Class on cannabis policy and research at University of Leiden Botanical Gardens with cannabis researcher Arno Hazekamp, PhD. Educating medical professionals is part of ASA’s work, and in June, ASA Chief Scientist and PFC Director Jahan Marcu PhD was invited to King’s County Hospital in Brooklyn, New York for two talks. On June 6, he discussed how cannabis interacts with the human endocannabinoid system with the Emergency Medicine department and oncology doctors. On June 7, he did grand rounds with medical students and faculty on cannabis and cancer. The hospital is exploring working with ASA’s Patient Focused Certification program on researching existing product use. From June 9-14, ASA staff attended the big annual meeting of the College on Problems of Drug Dependence in San Diego, California, to talk about CBD research and safety studies. Representatives from the U.S. Food and Drug Administration were there to discuss regulations in advance of their announcement approving the first cannabis-extract medication, Epidiolex. From June 23-26, also in San Diego, ASA chief scientist and PFC director Jahan Marcu PhD was at an ASTM International meeting on cannabis standards as chair of credentialing for the D37 Cannabis Committee, where ASA presented a video on the importance of training. At the end of the month, ASA will be attending the Cannabis Science Conference in Portland Aug 27-30. Look for them at booth 261. September 21-23, ASA will be presenting again at the Abilities Expo in Boston. In July, Consumer Safety Analytics Laboratory (AKA CannaSafe) of Van Nuys, California was certified for laboratory analysis of medical cannabis products under ASA’s Patient Focused Certification (PFC) program, one of several certified in the past two months. CannaSafe is the first laboratory to be awarded certification in southern California to engage in the PFC program. To achieve PFC certification, laboratories must pass two assessments each cycle. Assessment involve a facility inspection and review of method validation reports, employee training records, and other documentation required by law. CannaSafe joins a growing list of PFC certified cannabis businesses since the program was launched in 2015, including Harvest of Tempe (AZ), Sonoma Lab Works (CA), Berkeley Patients Group (CA), Humboldt’s finest (CA), The Werc Shop (WA), Kannavis (MD) BASA Collective (CA) and many others. PFC is the only nonprofit, third-party certification program for the medical cannabis industry based on quality standards issued by the American Herbal Products Association (AHPA) and the American Herbal Pharmacopoeia (AHP), which have been the basis for several states’ regulations. The AHPA and AHP standards offer comprehensive regulatory and product-safety guidance as well as best business practices for the production of cannabis and cannabis products. PFC is an international training, education, and certification program that has formed partnerships with accreditation bodies, and standards groups such as ASTM and AHPA. Recently, ASA announced a joint collaboration with the American Association of Laboratory Accreditation (A2LA) to expand the PFC program by offering a new accreditation program that incorporates the requirements of ISO/IEC 17025. For further information, see Patient Focused Certification. Missouri voters will find three different medical marijuana measures on the ballot when they go to the polls in November. The state’s legislature had been considering a bill that would have creates a robust program, but it died in conference committee at the end of the session. The Missouri secretary of state announced August 2 that three patient advocacy groups each filed enough signatures to qualify their initiatives. Two of the measures are constitutional amendments, which put them largely out of reach of meddling by state lawmakers, while the third would amend existing law. The constitutional amendment sponsored by New Approach Missouri would, like Oklahoma’s new law, allow physicians to recommend medical cannabis for any condition. If enacted, it would create regulated dispensaries whose products would have an excise tax of 4% and allow personal cultivation of up to six plants. The other constitutional amendment, proposed by Find the Cures, specifies qualifying conditions, allows for dispensaries whose products would be taxed at 15% percent. The statutory change put on the ballot by Missourians for Patient Care also specifies qualifying conditions and allows for sales, which would be taxed at 2%. Missouri is currently a limited-access CBD-only state. The legislature in 2014 passed a bill allowing patients with a seizure disorder and a neurologist’s recommendation to use cannabis extracts with no more than 0.3% THC, which has been available since 2016 through just two licensed providers in the state. Nic Easley’s introduction to medical cannabis came courtesy of injuries he sustained serving his country. The doctors at the VA prescribed medications to help him, but in 2006, four years after his honorable discharge from the Air Force, Nic turned first to the mountains then to cannabis in hopes of better results. He found them. What he also found, to his surprise, was that the caregiver who was cultivating and providing that cannabis knew little about agriculture. Nic, on the other hand, had grown up in the farmland of Wisconsin where he had the opportunity during middle school to work on field studies with a PhD Botanist before obtaining college degrees in Environmental Studies and Biology. A casual question to his caregiver -- “How do you grow this?” -- got him a look at the operation. The advice Nic gave his caregiver led to referrals to other growers who needed guidance. That was the start of his business, 3C Comprehensive Cannabis Consulting. The 2009 explosion in medical cannabis businesses in Colorado became his focus, putting his scientific background and 15 years of agricultural field and biological experience to work helping emerging entrepreneurs implement best practices. An avid outdoorsman and surfer who has worked as a Grand Canyon river guide and a backcountry ski guide, Nic passion for the environment animates his concern for minimizing pesticide use and the carbon footprint of cannabis production. 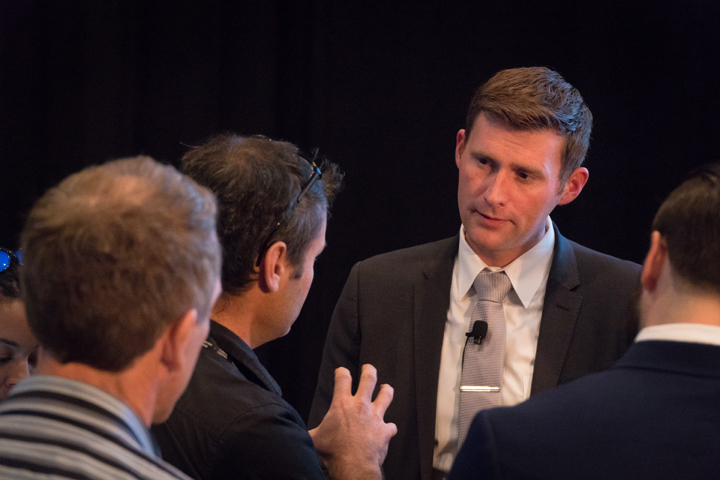 Nic’s background is science, but as his consulting business took off, he was able to hire people with strong business skills to address how to create a sustainable, socially just industry. 3C currently has clients in 26 states and 11 countries. Nic has also started a cannabis investment fund, Multiverse Capital, of which he is also CEO and managing partner. He has served on several state regulatory boards responsible for everything from agriculture and pesticides to business practices and public health. Looking forward, Nic sees accelerating change but a long process. A uniform federal approach would allow for consumer-friendly developments such as organic certification, but that’s still at least five to seven years out, in his view. In the next year or so, Nic expects four to six states to make significant progress on implementation and another three to five expanding beyond limited access to more robust programs as regulators see the benefits for jobs, revenue, and patients. As individual states each create their own rules, a range of options are being tested, but it creates uncertainty and other challenges for businesses seeking to meet patient needs. Are you registered to vote? Are all your friends and family? As Oklahoma and so many other states have shown, voting makes all the difference for safe access. Deadlines for voter registration vary from state to state, but September is the cutoff for many. September is also when ASA will put out its voter guide at http://www.votemedicalmarijuana.org. Come election day, get out and vote for candidates who support safe access and help others do the same.